As the day draws closer when the citizens of the UK will vote whether or not to leave the European Union (aka Brexit), the national debate continues to heat up. One of the newest and largest advocates for leaving the EU is the largest newspaper in the country – The Sun. The Sun made its stance very clear by running a full front page graphic saying BeLEAVE in Britain and another saying “Up Yours Delors” in reference to Jacques Delors, former three-term president of the European Commission. In the correlating article, The Sun published, “We must set ourselves free from dictatorial Brussels. If we stay, Britain will be engulfed in a few short years by this relentlessly expanding German dominated federal state”. Those strong words were distributed to The Sun’s more than 1.5 million readers, most of whom will be heading to the polls soon. It’s just the latest case in a debate that is tearing its way through the country. There are a number of reasons why voters want the UK to leave the EU, but most of them center on immigration and the economy. 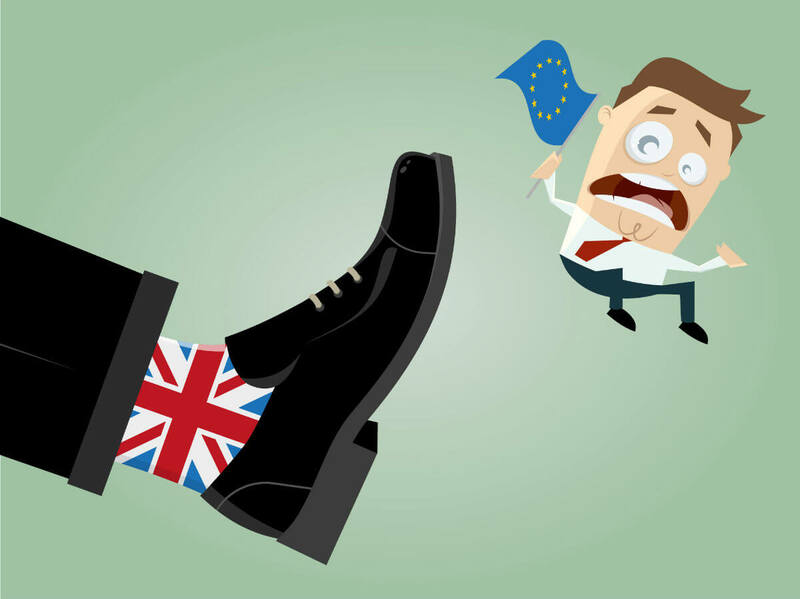 For supporters of leaving, the EU plays too large a role with burdensome regulations that limit the control of each individual member country. EU officials aren’t elected, which puts much of the power into the hands of people who may not be representing each country’s best interests. Leaving the EU, supporters argue, would give power back to the UK and separate the country from a bureaucratic mess and failing economic conditions. An emotionally charged stance is largely driven by the EU’s rules on internal migration. According to EU law, countries must allow an unlimited number of citizens from other EU countries into their borders. For the UK, that often means workers from less prosperous countries have immigrated looking for work and hurting Britain’s already fragile economy. On the flip side, supporters for remaining in the EU praise the economic benefits the organization provides. The EU is one of the world’s largest free-trade zones, which plays a huge role in the UK. More than anything, supporters of staying argue that leaving the EU would unravel decades of negotiations and cause chaos throughout the country, especially with the economy. Without being part of cohesive laws throughout the EU, many international businesses may move their headquarters away from London and devastate the job market, they argue. As terrorism becomes a growing fear across Europe, supporters of the EU say that staying helps the UK take advantage of coordinated security measures. The most influential supporter of staying is Prime Minister David Cameron, although he seems to be facing an uphill battle. The Sun encouraged readers to support staying in the Common Market in 1975, but things took a sharp turn thereafter, and the newspaper completely reversed its views. In recent years, many have said that The Sun has tried less and less to conceal its strong distrust and dislike for the EU. Sun staffers aren’t shy to admit their opinions have played a role in the paper for decades, with one associate editor saying the newspaper had “a long and legitimate campaign” against the EU. The Sun is owned by Robert Murdoch, another strong supporter of leaving the EU. Editor Tony Gallagher apparently agrees wholeheartedly with Murdoch, as he has shown throughout his newspaper career, and especially in his approval of the latest message. Will the Sun’s Support Sway the Vote? The Sun’s ideals typically match those of its large readership, which means that its strong stance in favor of Brexit may be preaching to the choir. With the majority of The Sun’s readers likely already firm in their decision of how to vote, it is up for debate just how much impact The Sun’s front pages will have. However, it does send a strong message to Prime Minister David Cameron and the supporters of staying in the EU that one of the largest newspapers in the country has a strong opinion in the opposite that it isn’t scared to share. Britons will take to the polls this week on June 23 to cast their votes for this game-changing proposition. While supporters of staying in the EU have held a strong lead for months, a recent surge by supporters of leaving has made the outcome less unclear. Accordingly to experts, there is a 40% chance that the UK will leave the EU. However, now that the proposal has gained so much steam throughout the country, even a UK that stays in the EU will be forever altered. Time will tell how the votes are cast and how, but certainly the financial markets consider this to be a landmark referendum. Recently a crowdfunded movie called ‘Brexit The Movie’ was posted on YouTube and has garnered about 450,000 views. Whatever the outcome of the vote, the UK will not be same after the referendum. You can watch the video below and decide for yourself.